I absolutely LOVE lamb, but rarely eat it for reasons I’m not entirely sure of. 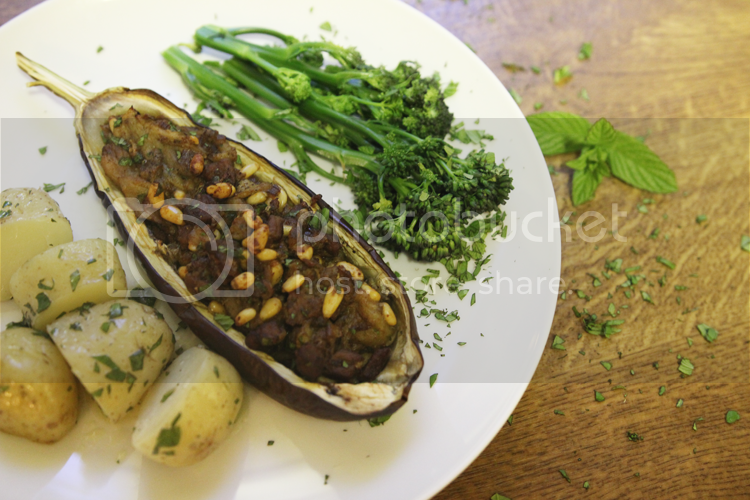 But when I saw a recipe in Good Food magazine for lamb stuffed aubergine while I was in the midst of a serious aubergine kick, it was just too perfect to ignore. Annoyingly, the area where I live seemed to be suffering a serious lamb shortage the day I made these as I went to three different supermarkets and couldn’t get lamb mince in any of them. What?! So I ended up using lamb leg steak instead, just dicing it up as small as I could manage and, though I’m still yet to try this recipe with proper mince, I suspect this version might actually be even better – certainly leaner, which can be no bad thing. The original BBC recipe also calls for ras el hanout, which I was sure I had in the cupboard so I didn’t bother buying any on the fruitless lamb mission. Turns out, I’d used it all so had to wing it by throwing in all the spices I did have which go into a typical ras el hanout blend. If you have it, use it, if not, just wing it. It’ll be fine. If I remember rightly, it also used sultanas but I’ll never be a fan, so I left those out. 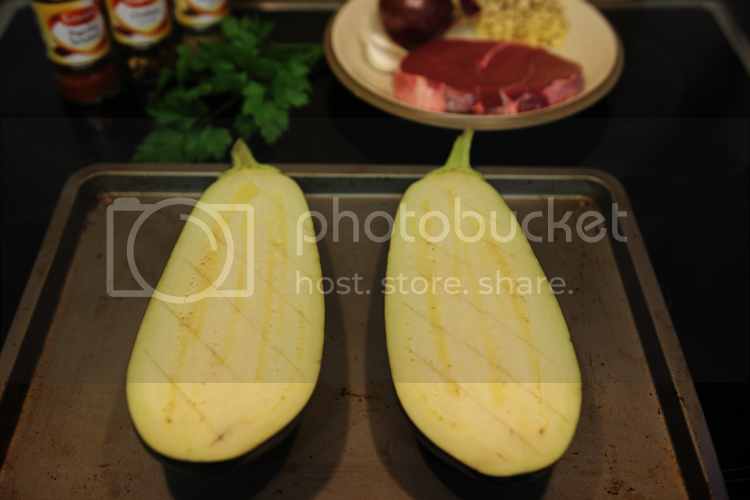 Start by preheating the oven to 200c (180 for fan ovens, or gas mark 6) and preparing your aubergine(s). Slice in half lengthways, score gently and spray or drizzle with a little oil. Cover with foil and bake for 50 minutes. In the meantime, finely chop the onion and crush the garlic. 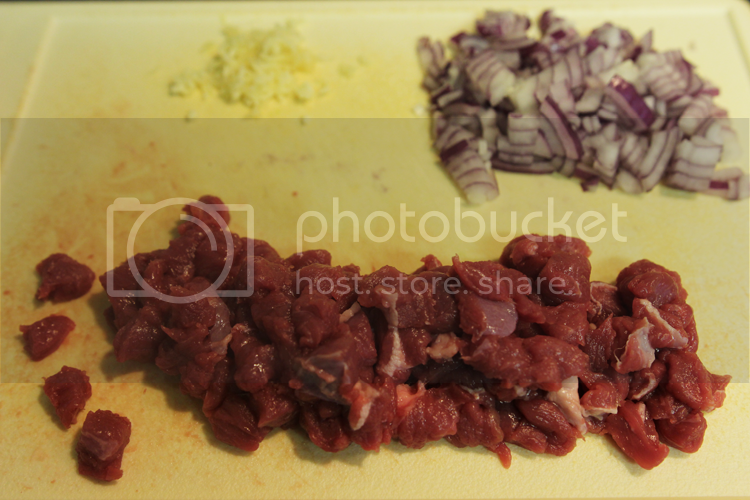 If using mince, you needn’t do anything with it but if you’re using leg steak, dice it up as small as you can manage. 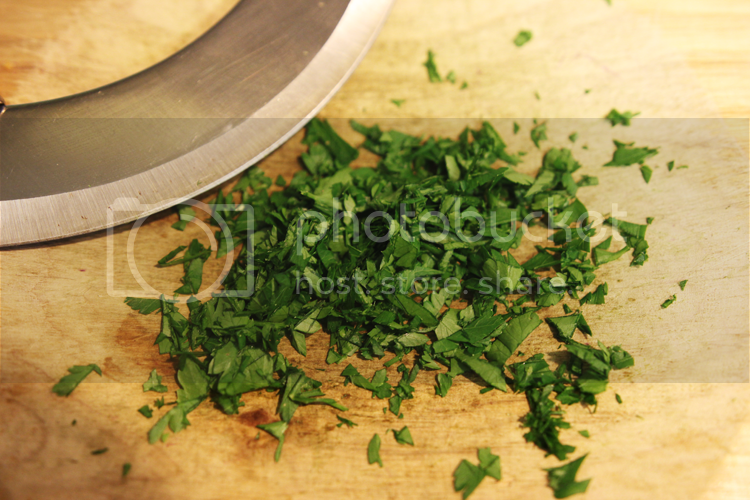 Chop up the parsely, too, get that out of the way. Warm up a frying pan over high heat, adding a drizzle of oil if using steak (you won’t need it if using mince). When the pan’s very hot, tip in the lamb and brown for somewhere between 5 and 10 minutes. When the liquid that comes off the meat has evaporated, you can move on. Add the onion, garlic and all the spices you’re using, and keep the heat up to allow the meat and onion to caramelise. 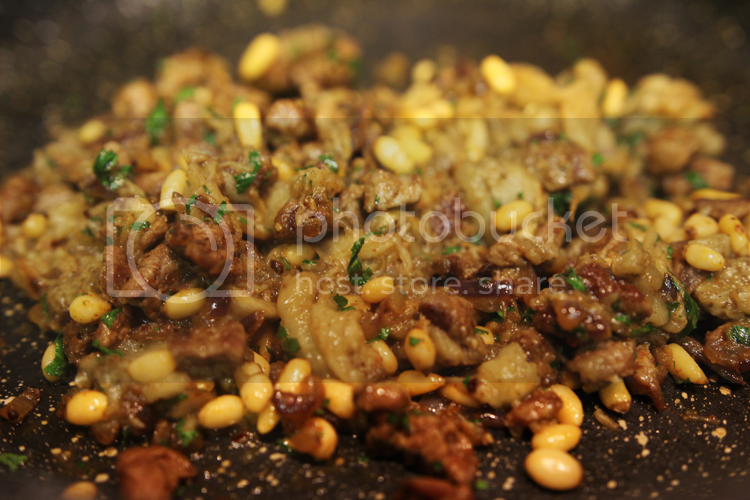 Add the pine nuts and parsley, then set aside. 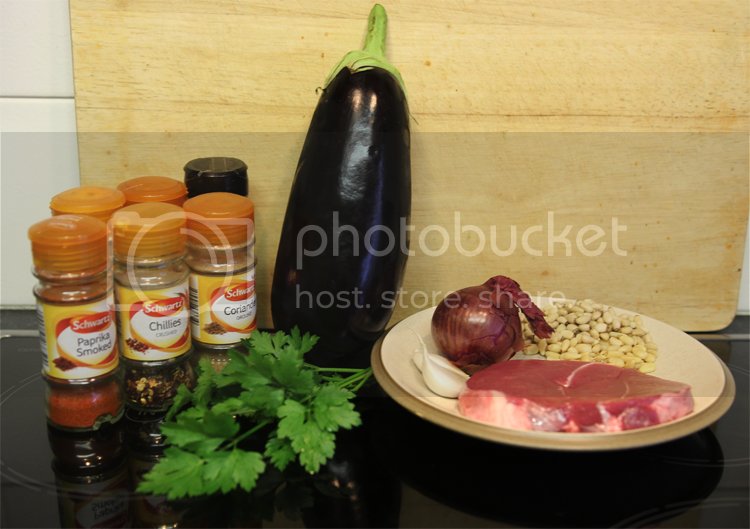 Once the aubergine is done, scoop the flesh from each half and add this to the pan with the lamb mixture. 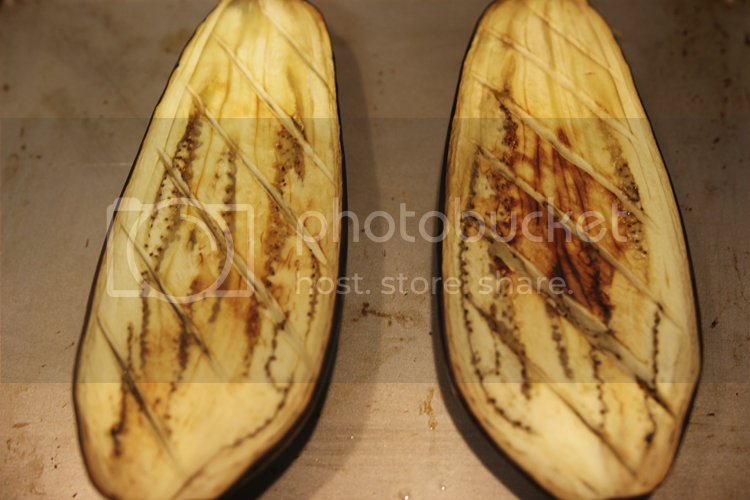 Make sure to leave a small border of aubergine flesh in the skins to keep them reasonably sturdy. 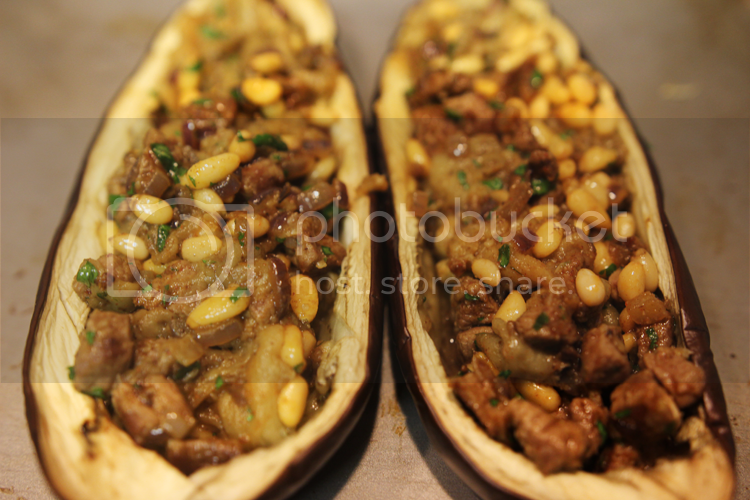 Scoop the lamb, mixed with the aubergine flesh, back into the skins. Return to the oven for 10 or so minutes to heat everything through, and serve with whatever you like – we had buttered Jersey Royals and steamed tenderstem broccoli. Perfection. Oh my God! This looks so good! I think I would prefer little meat chunks than mince. Hnnnnnnnnnngh!